We can’t say it enough – THANK YOU to everyone – riders, donors, volunteers, and staff for making the 2014 Revolution Ride another memorable, incredible day. The funds that were raised will support virtually every program that BORP offers which now includes a robust team sports program featuring adult and youth Wheelchair Basketball, Power Soccer, Goalball, and Sled Hockey; an Adaptive Health & Fitness Center, youth and adult outdoor adventures and the Adaptive Cycling Program. 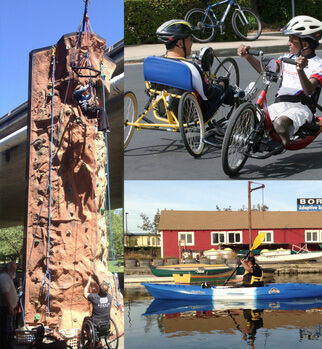 In addition, REV funds will enable us to launch two new activities: Adaptive Kayaking and Archery. The latter will be offered in partnership with the Bowman Archery Club and the East Bay Regional Park District. And how about the first Disability Awareness Day at the Cal – UCLA game on Saturday, October 18 featuring the introduction of Cal’s new Goalball team (the university’s first adaptive sports team ever!) Special thanks to BORP board member Matt Grigorieff and BORP Adult Program Coordintor Jonathon Newman for all they have done for this effort and all they are doing to spearhead adaptive sports at CAL. BORP is part of a national coalition, Athletics for All, dedicated to helping public high schools, and universities, develop adaptive sports programs that will enable students with disabilities to participate in high schools sports such as track and field. With all the documented benefits of youth sports, it is critical that we make more opportunities for youth with disabilities to enjoy the high schools sports experience. With the Department of Education and numerous local organizations like BORP behind this effort we are hoping to make great progress in the year ahead. Thinking of buying a new car? Consider Albany Subaru, who will be partnering with BORP in a national Subaru “Share the Love” Campaign. Between mid-November and early January, Subaru will donate $350 to one of several charities with every car sold. BORP is designated as the local charity by the Albany dealership. See below for more information. The cause of adaptive sports and recreation has a new partner – the Center for Disease Control recently released a report documenting the need for sports and recreation programming for people with disabilities. According to the CDC, people with disabilities are not getting enough exercise and, as a result, are three times more likely to have a major health complication such as heart disease, stroke, and/or diabetes. The report calls for doctors and health professionals to be stronger advocates for exercise with their patients with disabilities. Finally, BORP’s 1st Annual Adaptive SportsFest, on October 11th, featuring cycling, kayaking and climbing, was a great success – thanks to BORP Cycling Program Coordinator Greg Milano for organizing the event and the all the volunteers who pitched in to make it such a first time success. And special thanks to Coloplast, for supporting the event as our corporate sponsor. No doubt the 2nd annual Sportsfest will be part of our 2015 programming. You can read more about the inaugural SportsFest below. The 2014 Revolution Ride was the 12th in BORP’s history. On September 27th, over 190 fundraising cyclists of all abilities, along with nearly 100 volunteers, came together at the Trentadue Winery in Geyserville, CA to celebrate the Rev. To date, the event has raised over $189,000 for BORP’s adaptive sports and recreation programs! Scot Goodman’s official 2014 Rev photos are now online! Scot volunteers his time and talent to provide these amazing, professional photographs of the Rev and participants who make it happen. Thank you, Scot! Nearly 2,000 people donated to the 191 registered fundraising riders this year. 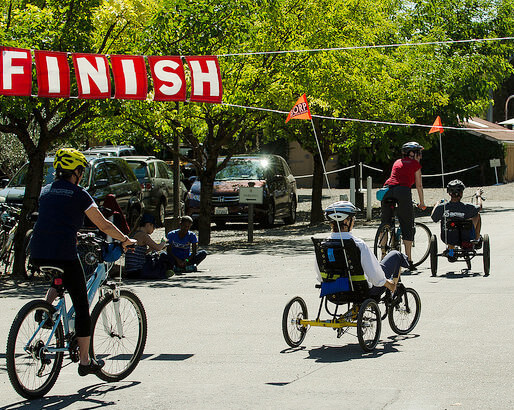 54 adaptive cyclists rode one of the four routes this year supported by over 40 outriders, tandem captains and adaptive assistants. That’s the most adaptive cyclists since 2009. The top fundraising team at the Revolution this year was the DFLs who raised over $30,000. Team captain, Don Hunt, was the Revolutionary Award recipient this year in recognition of his participation and support of the event and of BORP for the past nine years. 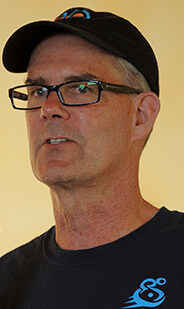 The top individual fundraiser this year was Robert Doty, another member of the DFLs. Robert smashed all records as a Rev fundraiser, bringing in an astonishing $18,145 for BORP’s adaptive recreation and sports programs! Thanks to Robert, Don and all the DFLs for the incredible fundraising efforts. Inaugural SportsFest was a Hit! BORP hosted the first-ever Adaptive SportsFest on Saturday, October 11, 2014. Over 75 people with disabilities showed up with another 50+ families and friends. Over 20 volunteers made kayaking, cycling, and climbing on “No Limits” 30 foot outdoor climbing wall possible for everyone. A majority of the participants were first time BORP participants and many were out for their first sporting activity after a recent injury. The event was supported by a crew of kayak guides from our friends at non-profit ETC (Environmental Training Companions). Former BORP board president Kristi Grotting volunteered as a safety kayaker and tandem kayak guide. It couldn’t have been a better day. Photos can be seen on BORP’s facebook page. Days like SportsFest open the doors of possibility to so many people living with disabilities and their families. It also provides a day for people with disabilities to network and meet others. Sportfest introduced kayaking in a can-do way. One participant with CP tried kayaking for the first time and needed an adaptive grip for one hand. She was barely dipping the paddle in the water, and only one side at a time. The instructor talked her into holding the paddle blade up and down when it went into the water. Then he talked her into putting the blade into the water and drawing it back. Then she started to alternate dipping the blade to the left and right. Once she got the hang of it and the rhythm she could have gone on for hours. When she got out of the boat she had the biggest smile on her face, because she had really paddled the boat! Then there was Michael, who drove down from Reno. He was injured (T10) a year ago. He has an amazing attitude for a newly injured person. No looking back for him. He never says, “I used to…”. As he got in the kayak, he admitted that he had never paddled before. After some basic instruction, he had it immediately. A natural. Michael and the guide stayed out on the water serving as a safety boat for nearly two hours. Michael was thrilled. On top of everything the weather was just right and the Blue Angels did a fly by. Thanks to all the participants, volunteers, family, friends, and sponsors who contributed to the success of this amazing day! SportsFest will be back! Support our adaptive recreation and sports programs! to help keep BORP’s programs going strong. November 15-16 – BORP Power Soccer Tournament in Berkeley. The BORP Bombers, Crushers, and brand new Shockers take on regional opponents. 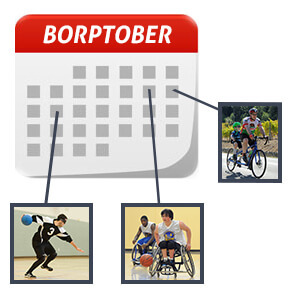 Check the BORP Activities Calendar for more upcoming BORP events! Volunteers are needed for BORP’s Adventures and Outings Program for various outings this Fall. on November 15-16, 2014. No experience necessary. Training provided! 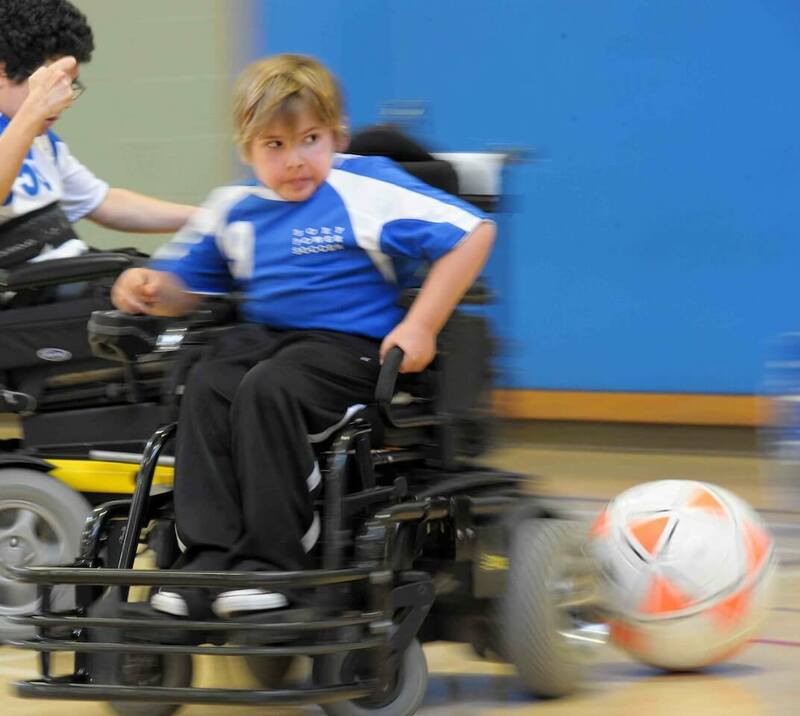 For Power Soccer shifts Please contact Jonathan Newman at jonathan@borp.org or via phone (510) 849-4663 x1304 if you are interested in volunteering. Include which shift(s) you would like to work. For information on Adventures and Outings volunteer opportunities, please call A&O Coordinator Lori Gray (after 10am, please) at (510) 843-4398. 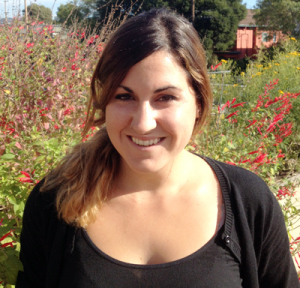 Carrie King is BORP’s new Health & Fitness Program Coordinator. She has a B.A. in International Studies/Political Science from UC San Diego. She moved to Alameda in 2013 and began working as a Farmers Market Manager, where she became interested in the impact food access and nutrition knowledge have on community health and wellness. After a year of managing markets, she left in June 2014 to backpack through Latin America for three months. Upon returning, she wanted to combine her love of athletics and fitness with her experience in food education, and is extremely excited to have found BORP, where she plans on expanding the resources available through the Fitness Studio. In her free time, she enjoys running and weight lifting, cooking, photography, and live music. Carrie can be reached at carrie@borp.org or (510) 849-4663 x1319. BORP is honored to be selected as Albany Subaru’s designated Home Town charity for the dealer’s end-of-year Subaru “Share the Love” Event. 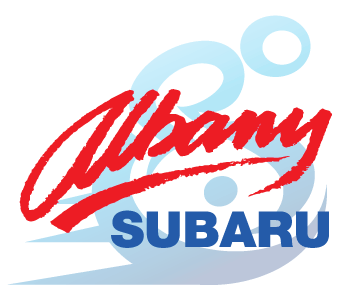 For every new Subaru purchased from Albany Subaru with BORP as the designated charity between November 20, 2014 and January 2, 2015, BORP will receive a $350 donation from Albany Subaru! Albany Subaru is located at 718 San Pablo Ave in Albany, CA. US Ambassador John Heffern (left) hosted Armenian and US Sports for Success delegates at his home. Jenny Kern is pictured at far right. Jenny Kern, BORP friend and cyclist since 2007 writes about her experience representing BORP as a delegate of a US State Department funded “Sports for Success” exchange program in Armenia this past June. Imagine the world before wheelchair accessible gyms, Goalball, Power Soccer, Quad Rugby, adaptive cycling and lifts into pools. This was the dominant experience in the US and the world before the disability rights movement came of age and BORP was founded by Susan Sygall in the 1980s. Regrettably, this remains the experience of much of the rest of the world today. But, the world is changing, one adaptive sport at a time! One way this disparity is being addressed is through sports exchanges in which adaptive sports professionals share resources, ideas, experiences, and equipment. This project was designed to expand adaptive sports opportunities for Armenians with disabilities. To date in Armenia, (a former Soviet Republic bordering the countries of Georgia, Turkey, Azerbaijan, and Iran), these opportunities have included men’s wheelchair basketball, table tennis, arm wrestling, winter skiing, sailing, and powerlifting. The sports available to women, girls and youth with disabilities have been very limited. The physical landscape is challenging, but the determination of disabled people’s organizations (DPOs) to integrate people with disabilities into all aspects of society is strong. To introduce handcycling, I brought a Dragonfly designed by RioMobility that can turn a manual wheelchair into a handcycle. Over the course of the eight day trip, dozens of Armenians with and without disabilities rode the Dragonfly and experienced a tiny slice of the freedom that handcycling can enable. Unfortunately, adaptive cycling has not been part of the Armenian culture. Regular two wheel cycling is not typical either. Nevertheless, we are hopeful that an outcome of this project will be the introduction of adaptive cycling in Armenia. To that end, BORP donated a child’s adaptive trike to one of the Armenian partner organizations called PYUNIC, The Armenian Association of the Disabled. Our trip leader from MIUSA was Susie Grimes, former BORP Quad Rugby coach and Wheelchair Hall of Fame inductee. Other U.S. sports professionals in our delegation included Mary Hodge, the US Paralympic powerlifting coach; Daniel Ferreira who coaches wheelchair basketball and is the Adaptive Sport Program & Event Facilitator for the Chicago Park District; Carly Schmidt of Oregon Disability Sports who teaches kids with disabilities many adaptive sports; Connor Inslee CEO of Washington State’s Outdoors for All Foundation that focuses on adaptive outdoor adventure. MIUSA staff member Jamie Rivas administered the project from home base in Eugene. 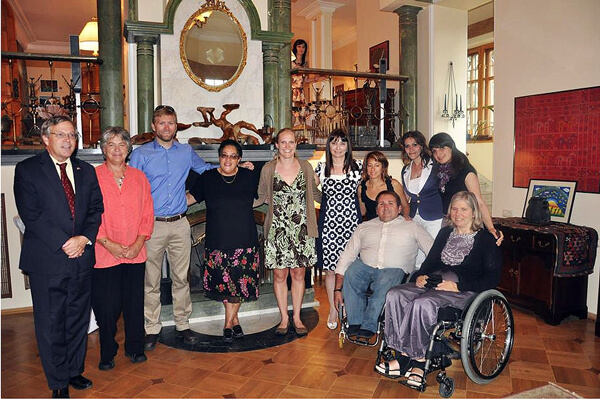 Ten Armenian delegates working toward expanding adaptive sports and social inclusion for people with disabilities in Armenia hosted our delegation. The two main DPOs were Pyunic, the Armenian Association for the Disabled based in Yerevan, Armenia’s capital (See www.pyunic.com) and the Agate Center for Women with Special Needs based in the small city of Gyumri (See www.agatengo.org). The range of our activities was vast and included getting to know our Armenian exchange partners and some of their families, hosting two press conferences, meeting the vice mayor of Yerevan and the Mayor of Gyumri, demonstrating adaptive aquatics, power lifting, wheelchair basketball, hand cycling and aerobics, meeting with several DPOs, attending a three day adaptive sports festival organized by Pyunic, visiting the city of Gyumri (home of Agate center for women and girls with disabilities) and a lovely reception at the home of the US Ambassador’s home. Some of our teammates were on a local TV show and all of us gave PowerPoint presentations about our work and play with adaptive sports. A highlight for me was dancing to traditional Armenian music! I am so grateful to BORP and MIUSA for the opportunity to contribute to the movement of people with disabilities in Armenia. Superfest International Disability Film Festival is a showcase of juried films held in the San Francisco Bay Area. 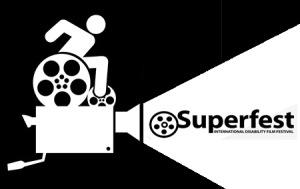 This annual competition celebrates cutting-edge cinema that portrays disability culture in all its diverse, complex, and empowering facets, and is the longest running festival of its kind in the world. The event is wheelchair accessible. Audio description, captioning, and ASL will be provided. Please refrain from wearing scents so that people with multiple chemical sensitivities may participate. If you watched the World Series this past weekend, then you may have seen BORP Cycling Program Coordinator Greg Milano and BORP cyclist Jorge Alvarado handing out hot dogs to the flotilla in AT&T Park’s McCovey Cove! For the past four years, Greg has joined the ranks of floating Giants faithful at several regular season games to soak in the fun and grill some sausages. He makes the rounds from boat to boat to offer up his tasty treats for free. MLB.com tagged along with Greg on his kayak at Game 4 of the World Series to see firsthand what the festive scene is like on the water.